The Mining Unit at the Ministry of Natural Resources, responsible for issuing dredging permits, has confirmed to The San Pedro Sun that no dredging is happening anytime soon at the dock by Ruby’s Hotel in downtown San Pedro. 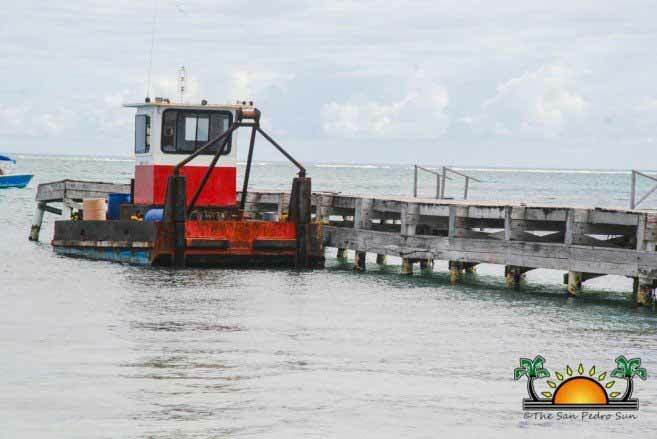 The presence of a dredging machine parked next to the dock has raised concerns since the new proprietors of the property, San Pedro Belize Express Water Taxi (SPBE), have expressed plans to dredge the area to make way for a new boat terminal. SPBE plans to relocate their boat services to the said property, and dredging is a must to accommodate their facility and large boats. This idea has been met with much resistance by islanders and local authorities, who believe the area is not fit for such a project. The dredging machine has been docked at the pier for two weeks now, leading many to believe that it was just waiting for the order to start dredging around the dock. Personnel from the Mining Unit told The San Pedro Sun that they are aware of the situation and are in touch with SPBE. As far as they know, they have not submitted any applications for a dredging permit. Thus, no such activity is to take place by that dock. In the meantime, they will continue monitoring the situation and are waiting to see if an application reaches their office.